Brand: This might be more important to some than others, but if you have a favorite drummer that plays a brand that we carry, you might want to start your search there. We carry drum sets from Pearl, Yamaha, Gretsch, and Ludwig, so you’re sure to find a few that jump out at you! Just click on the “Brand” filter to see only the drum sets from that one manufacturer. Shell Pack vs. Hardware Included: Some drum sets featured on our website include hardware (cymbal stands, snare stand, bass drum pedal, throne), whereas others only include the drums themselves (with drum heads and tom mounts). If you already have a pedal, some stands, or even a rack unit, then a shell pack might be better for you, but if you’re starting from scratch, wouldn’t it be nice to have more included? Simply select either option in the “Type” filter. Most brands have both options available. Pieces: All this means is, “How many drums in your set?” – We have options for everything from a small 3-piece up to a large 7-piece, and everything in between! What goes into deciding how many pieces you’ll want for your drum set though? Typically, certain genres are associated with different drum set sizes: 3-4 pieces for Jazz and 5-7 pieces for Rock, but of course there’s always some cross-over depending on any one drummer’s personal taste. But those figures are a good place to start. The typical starter set is usually a 5 piece, right in the middle. This typically includes a bass drum, a snare drum, two rack toms, and a floor tom. Of course these all come in different sizes, but knowing how many you want of each is a great start. The filter labeled “Pieces” will help you narrow down your search for this. Some sets may or may not include a snare drum. As with every page on our Website, you also have the option to sort your results alphabetically, or by popularity, rating, and price. Be sure to read the descriptions for each drum set to see what is included, as some even include cymbals or a free set-up video. However, if you find your perfect drum set and these are not included, they are available separately through our website (try similar filters in each of the Cymbal categories!). In addition to that, drum sticks, drum heads, and anything else you will need for your new drum set are available from Steve Weiss Music as well. Please feel free to give us a call with any questions you may have at 1-888-659-3477 – our experienced sales team is always glad to help! 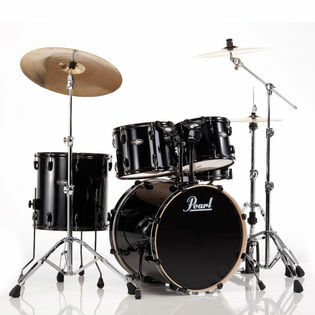 Update 11/21/15: We just created a page showing some popular Pearl Beginning Drum Sets. PS- Those new filters are really working out nicely! Next post: Should you buy or rent a marimba?